MINNEAPOLIS – Vicki Bendus (Wasaga Beach, Ont. 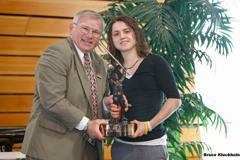 ), a junior forward from Mercyhurst College, was today named the 2010 Patty Kazmaier Memorial Award winner. In its 13th year, the award is presented annually by The USA Hockey Foundation to the top player in NCAA Division I women’s ice hockey. Bendus received the award at a brunch ceremony at the University of Minnesota's McNamara Alumni Center. She was chosen from a group of three finalists that also included Kelly Paton (Woodstock, Ont. ), a senior forward from the University of New Hampshire, and Noora Räty (Espoo, Finland), a freshman goaltender from the University of Minnesota. "Vicki is a wonderful person and a tremendous leader, who plays with great emotion each and every game," said Michael Sisti, head coach of Mercyhurst College. "She does so many things well and had the best season of her career." A team captain, Bendus is near the top of the NCAA leader board in nearly all offensive categories, including points (65), shorthanded goals (5), points per game (1.81), assists per game (1.03) and goals per game (0.78). A RBK Hockey First Team All-American, her 65 points tied for first in the NCAA as she helped lead the Lakers to their eighth straight CHA playoff championship and the No. 1 overall seed in the NCAA tournament. In College Hockey America play, Bendus finished the season as the league leader in points (26), while finishing second in both goals (11) and assists (15). For her efforts, she was named the CHA Player of the Year and garnered First Team All-CHA honors. In addition, she was a four-time CHA Player of the Week selection and was named to the Preseason All-CHA Team. Bendus was also among her team’s statistical leaders. She was first in shots (194); tied for first in points (65) and shorthanded goals (5); second in goals (28), assists (37) and power-play goals (8); tied for second in game-winning goals (5); and fourth in plus/minus (+37). Off the ice, Bendus volunteers regularly at the Erie Veterans Hospital, helping with patients and organizing events, including evening activities and field trips. Additionally, she took part in the annual Mercyhurst Thanksgiving Food Drive. NOTES: Vicki Bendus is the first Patty Kazmaier Memorial Award recipient from Mercyhurst College … The 2010 Patty Kazmaier Memorial Award brunch was held in conjunction with the NCAA Women’s Frozen Four, which will conclude tomorrow (March 21) with the national championship game between the University of Minnesota Duluth and Cornell University at 12 p.m. CDT at the University of Minnesota's Ridder Arena. The game will be televised live on CBS College Sports... FOX Sports North's Marney Gellner served as the event's master of ceremonies, while Caitlin Cahow, member of the silver medal-winning 2010 U.S. Olympic Women's Ice Hockey Team, delivered the keynote address ... The Patty Kazmaier Memorial Award recipient is chosen by a 13-member selection committee comprised of NCAA Division I women’s ice hockey coaches, representatives of the print and broadcast media, and a representative of USA Hockey, the National Governing Body for the sport of ice hockey in the United States … The Kazmaier Award is supported in part by a grant from the National Hockey League Foundation ... For more information on the Patty Kazmaier Memorial Award, visit PattyKaz.com.